British tabloid the Daily Star agreed to pay Rockstar Games a "substantial" amount of money for printing fake Grand Theft Auto: Rothbury story. 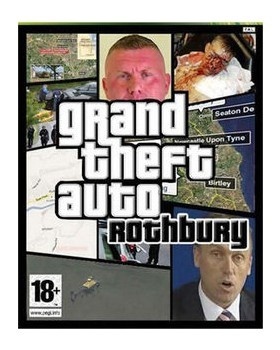 Back in July, the Star posted a story on its website claiming that a Grand Theft Auto was already in the works based on the crimes of Raoul Moat, a gunman who shot his ex-girlfriend, her lover, and then himself after a standoff with police near the town of Rothbury, U.K. It ran with an image purported to be the cover art for the game. The story was pulled from the website after the Daily Star realized that no such game was being made. In response, Rockstar Games parent-company Take 2 Interactive sued Daily Star-owner Express Newspapers for printing lies and damaging the videogame company's reputation. In court in London today, the Daily Star's lawyer agreed before a judge that the story was "untrue" and apologized for the harm it caused. Daily Star agreed that it did not attempt to contact Rockstar Games before the story ran and that it will pay a "substantial" sum of money for the damages it caused. Melanie Hart, representing Rockstar, presented the evidence before Mr Justice Tugendhat. The story's leader referred to Rockstar Games as "questionable idiots" and solicited quotes from family members of the victims of Moat's crimes. "I can't believe someone wants to make money out of people who have been killed," the grandmother of Moat's ex-girlfriend said. "It is sick - it's blood money. The game is beyond belief." Hart summed up the agreement: "In those circumstances, the defendant is here to apologize to Rockstar Games for the damage and distress caused by their publication of false allegation. The defendant has also agreed to pay substantial damages to Rockstar Games and has also agreed to pay their legal costs." The Daily Star's lawyer, Clare Kissin, agreed by saying, "Express Newspapers Ltd accepts that the allegations made against Rockstar Games are untrue. The defendant apologizes for the upset and damage caused." Unfortunately, it is unknown whether the writer of the offending story, Jerry Lawton, is still employed by the paper or whether he will pay any amount of the damages. Lawton caught the ire of gamers when he posted an update to his Facebook page after the controversy berating "adult gamers" "who sit around all day playing computer games." Lawton said, "You would think I'd denied the Holocaust!!!" No, but you did cost your company millions of dollars in damages for a sensationalist story with no basis in fact. I think that ranks pretty high on the screwup scale.